Think of a leader who you would consider to be “political” in your organization. What words would you use to describe this leader? What images come to mind? My guess is that you may have thought of adjectives such as “self-serving,” “manipulative,” “deceptive,” or “untrustworthy.” Or maybe this question prompted you to visualize images of secret pacts being made behind closed doors. While the term political skill, or political savvy, generally elicits more negative than positive perceptions, it isn’t inherently a bad thing. In fact, leaders can utilize their political skill to create positive outcomes. They can use it to successfully meet their organization’s leadership challenges and to improve the performance and productivity of their work teams. Leaders can also use these skills to enhance their own, and perhaps their direct reports’, chances of career advancement. If leaders want to become more politically savvy, Gerald Ferris (a professor of management and psychology at Florida State University) and colleagues have demonstrated that they’ll need to master 4 skills. In addition, researchers at CCL and Davidson College recently expanded Ferris’s typology to include a fifth skill. All 5 political skills are described below. Social Astuteness – the ability to observe others and to accurately understand them. Socially astute leaders are good at reading people’s non-verbal behaviors and can intuitively sense the motivations of others. Interpersonal Influence – the ability to influence others using a compelling interpersonal style. In particular, leaders with strong interpersonal influence are good at establishing rapport with others, they communicate well with others, and thus, they are also good at getting others to like them. Getting others to like them, in turn, helps them influence others more easily. Networking Ability – the ability to establish relationships with others. People with high networking ability have strong ties with many people, including influential people at work. They are particularly skilled at leveraging their networks to obtain the needed resources to accomplish both personal and organizational tasks. Apparent Sincerity – involves being transparent, honest, and sincere with others. Leaders with apparent sincerity believe their word is their bond – they do what they say they will do. Image Management – the ability to intuitively know what to say to influence others and knowing how to make a good impression on others. How do we know that these individual political skills really matter? Most research to date has examined the relationships between overall political skill and leader effectiveness, but it has not examined the associations between each of the 5 individual political skills and effectiveness. In a study conducted by researchers at CCL and Davidson College, we addressed this knowledge gap by finding that leaders who had greater social astuteness, interpersonal influence, networking ability, and image management received higher leader effectiveness ratings from their bosses than leaders who scored lower on these political skills. Apparent sincerity was not found to be important for men, but women with higher levels of apparent sincerity were perceived to be more effective leaders than women with lower levels of apparent sincerity. Put differently, as unfair as it may be, women are penalized when they exhibit low sincerity, whereas men are not. Of the 5 political skills, image management and interpersonal influence are the most important for helping a leader to have more impact at work. Finally, image management is more important for middle managers as compared to upper-level managers. By contrast, interpersonal influence is more important for upper-level leaders as compared to middle-level leaders. In addition to having traditional managerial skills in areas such as budgeting, planning, coordinating, and the like, all leaders need to also possess political skill. They especially need to be adept at making good impressions and exerting interpersonal influence on others. Women leaders may also want to pay particular attention to whether or not they are perceived as being genuine and sincere. 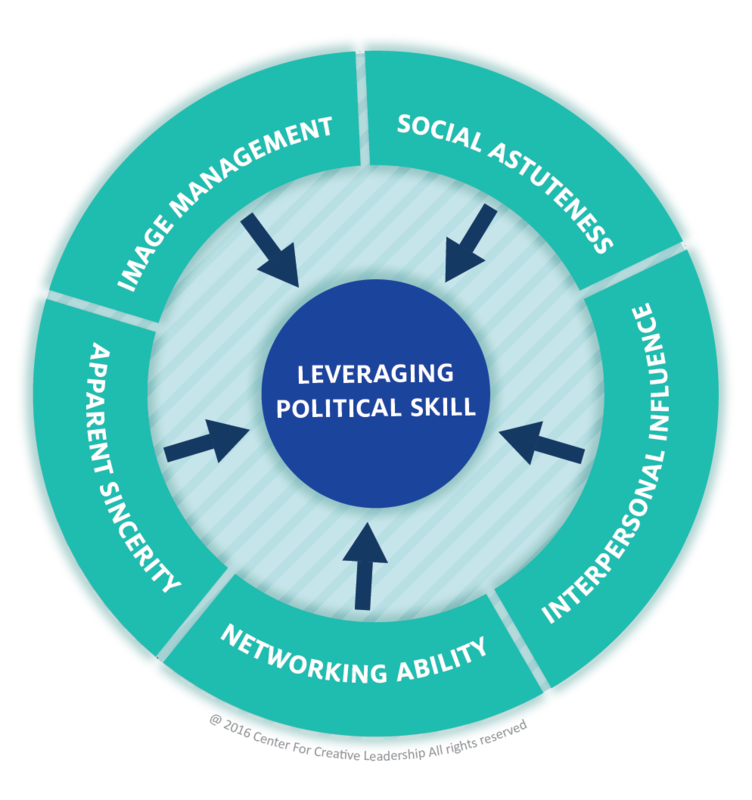 Possessing these political skills should enhance leaders’ effectiveness at work, improve their team’s performance, and improve their own chances of career advancement. leverage work relationships. Center for Creative Leadership: Greensboro, NC. Snell, S., Tonidandel, S., Braddy, P. W., & Fleenor, J. W. (2014). The relative importance of political skill dimensions for predicting managerial effectiveness. European Journal of Work and Organizational Psychology, 23, 915-929. This entry was posted in Communication & Leadership Secrets, Influence, Networking. Bookmark the permalink.